Made by PigeoNation Inc. which is a cover for Hato-King which is a Japanese Doujin circle. 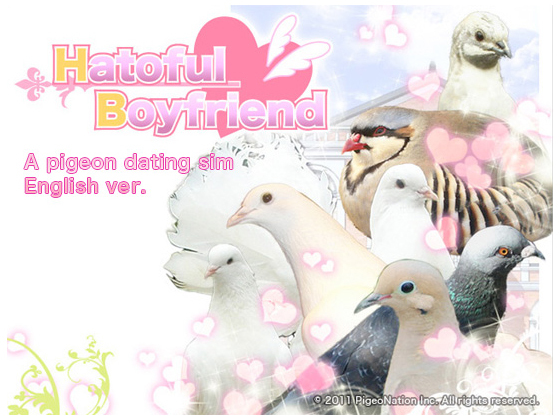 Who for some reason made a pigeon dating sim. Hatoful Boyfriend (Ã£ÂÂ¯Ã£ÂÂ¼Ã£ÂÂ¨Ã£ÂÂµÃ£ÂÂÃ¥Â½Â¼Ã¦Â°Â HÃÂtofuru Kareshi?) is an otome visual novel/dating sim created by Hato Moa that features pigeons as characters rather than the more common human anime characters. The title of the game is a "pun on the words 'heartful' (also 'hurtful') in English and 'hato' (pigeon/dove) in Japanese." The player character is a human girl who is attending St. PigeoNation's Institute, and is the only human at the institute. As each of the pursuable male pigeons are introduced throughout the game, they are shown with an anime version of what they would look like as a human, though this is only shown for the first meeting. The game was originally released only in Japanese, but the developer later released an English patch after employing a translator, Nazerine. A sequel to the original game, Hatoful Boyfriend HolidayStar, was released in 2012, with the English-language translation being released on Christmas Day of that year. The game also has 3 Drama CDs. The full version of the first game contains eight pursuable birds and a long mystery route, called BBL or Bad Boys' Love, and sometimes referred to as "Hurtful Boyfriend". One of the spurs to the game's popularity is due to a playthrough and image upload recorded by Angie Gallant on the Quarter to Three forums. Playthrough with commentary, and probably manly tears please. Big brother is still watching you. Facebook is starting to become the most hated website. Eng patch? I actually might do it.